healthy, lose weight, reverse a medical condition, fight aging or improve your energy, you’ll find the information you need to succeed. Dr. Petrucci: We pay special attention to what happens when your immune system gets off track and what you can do about it. We break down the patterns of an immune-boosting lifestyle so you know exactly where to begin and what to include in your diet to reach your goals. We also answer questions about superfoods, herbs, vitamins, minerals and supplements and include tons of excellent recipes to try! Q: Do you go beyond food? Are there other topics you explore? Dr. Petrucci: Yes, boosting immunity goes beyond the food that you put on your plate. We also explore how you can improve your sleep, enhance your cells through detoxing and benefit from immune-boosting breathing and moving. Dr. Warner: If you’re more interested in practical application than scientific theories, we’ve got you covered there, too, with chapters that outline how to revamp your kitchen for boosting immunity and how to plan and stock your kitchen for the nutritionally superior immune-boosting foods. Q: How did you both get interested in immunity and more holistic methods of practicing medicine? Dr. Warner: I was educated at Temple University in obstetrics and gynecology and started in private practice in a conventional OB-GYN office after my residency and working as the Chair of the Department of OB-GYN at two hospitals. But shortly after starting the practice, I realized that although I was trained to do an awful lot of medicine, much of it wasn’t relevant to getting and staying healthy. I started training with herbalists and energy workers and became involved with the American Board of Integrative Holistic Medicine. In 2004, I founded Medicine in Balance, a collaborative holistic medical practice in Langhorne. Dr. Petrucci: I earned my Doctor of Chiropractic degree from the Logan College of Chiropractic University Programs. I’ve also done extensive postgraduate coursework in Europe and am proud to be one of the few practitioners in the United States certified in Biologi- cal Medicine by the esteemed Dr. Thomas Rau of Switzerland. I learned early on that looking and feeling amazing came down to learning simple lifestyle principles. Deep nutrition isn’t about fancy powders, ancient elixirs or the latest creams. Instead it is about reprogramming the body to get back to the basics and eat and live in a way that naturally boosts immunity. My work includes a kids’ health and wellness program called Superkids Wellness and I run a consulting practice called PaleoSmart System and International Wellness. Q: What was it like to work on this book together? Dr. Petrucci: Wendy lives the lifestyle she promotes and you can’t help but feel a sense of calm in her presence. Her talents as a physician are matched by her truly good heart. Dr. Warner: This has been an amazing journey that wouldn’t have happened without Kellyann. She has amazing energy and enthusiasm and we learned that our strengths complement each other perfectly. 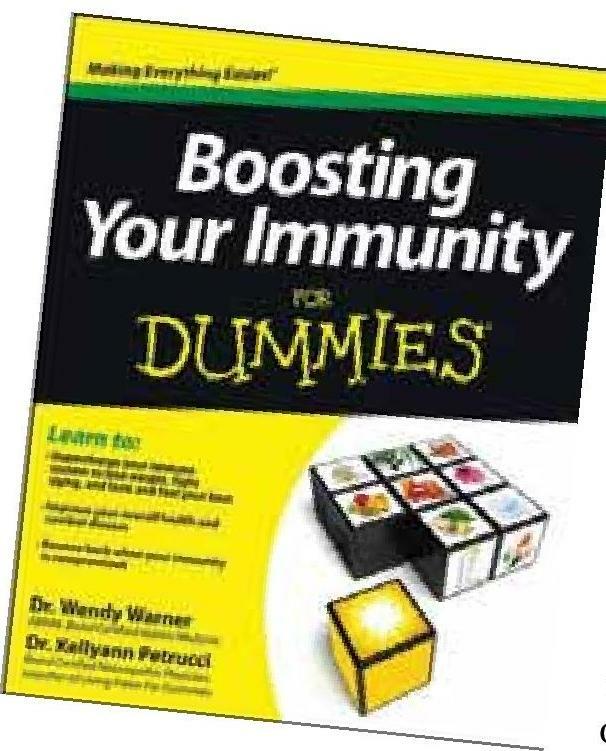 Boosting Your Immunity for Dummies can be found in area bookstores and online. To receive periodic health information updates from Dr. Warner, sign up at her blog at MedicineInBalance.com. Dr. Petrucci offers free nutritional videos and a weekly dose of news, tips and inspiration at her website, DrKellyann.com. January 2014. Phil Gutis is a writer, editor and contributor to Natural Awakenings magazine. Connect at PhilGutis@gmail.com. This entry was posted in DEPARTMENTS, Local Articles and tagged dr. petrucci, dr. warner, holistic medicine, immunity, integrative medicine, kellyann, paleosmart system, superkids wellness by Healthy Living Bucks and Montgomery Counties. Bookmark the permalink.